Sorry guys (ad girls), this is going to be a rather text heavy and descriptive post of a bit of my early training. On Friday the 15th of January I had Traditions. This is a training class for all Disney cast members that goes over the history of the company and the universal goal of the Walt Disney company: to create happiness. It was a bit emotional, as it started to hit us all just what kind of journey we are about to embark upon. We had such a big group of people arrive on the same day I did that we were split into two groups, one that had Traditions at 8am, and the other in the afternoon at 1:30 I think. Obviously I was in the morning group. We took three overcrowded buses specifically for us to Disney University, which is back behind the Magic Kingdom. From there we were split into smaller classrooms of about 60 people or so for the rest of the day. Normally this class is about either hours, but since I and the others with me were all College Program kids, our version is shortened to only 4 hours. We learn the same things, we just do it in half the time, so it moved pretty quickly, as you can tell. I had two great trainers that taught the class, Casey and Christian (sorry, I didn't take any pictures of them). We talked briefly about the company and the heritage that Uncle Walt built, and how we move that forward through all of our actions. We also started to talk about the four keys, which is what we use to guide our actions and responses to situations. They are, in order, Safety, Courtesy, Show, and Efficiency. This is what all the cast members use everyday and what set us apart from other companies. Normally we go out to the Magic Kingdom to observe these keys in action among the guests, but we were apparently getting some lighting and thunder so we instead sat in our classroom and went over hypothetical situations instead. I say apparently because we didn't hear and/or see it at all, being tucked far enough inside the building that we had to take the word of others (and smartphone weather apps). About halfway through we got our company IDs, which were cool. I knew I could then use that to get into the parks, which I think pretty much all of us had been planning on doing. However, right at the end, we had Mickey Mouse come in and interact with our class for about 5 minutes. This is where things really became real for me. So he handed out a few little figures of Disney characters to people answering trivia questions, and then he left us with a present and walked out. As he was leaving I realized that it's just a little bit ridiculous that he's a mouse. I don't know why I thought this, or even cared about it really, but seriously guys, he's a mouse. That's it. I can't even explain how I was feeling/thinking. Anyway, the present he left us was a box with all of our nametags. Mine was coincidentally the first one called out, and since we were going to all out them on together I placed it on the table for just a moment. Then it really hit me. Oh my gosh. I'm actually here. This is actually happening. I work for Disney. I'm fulfilling my dream. And then, I work for a mouse. Also pictured above are the Mickey Ear hats that we all received. As soon as everyone had gotten their nametag, we all put ours on. I was so excited, it was awesome. That thing was a badge of honor to me. It made it all real to me. But then class was over and we were loaded back on our buses and headed home. Of course I went out to the parks that night, specifically Epcot. What can I say? It's my home park now! That's where I'll be working in just a few days. I even rode most of the rides that I could possibly end up working. However I couldn't have that late of a night because I had to get up early the next morning for Welcome to Operations! 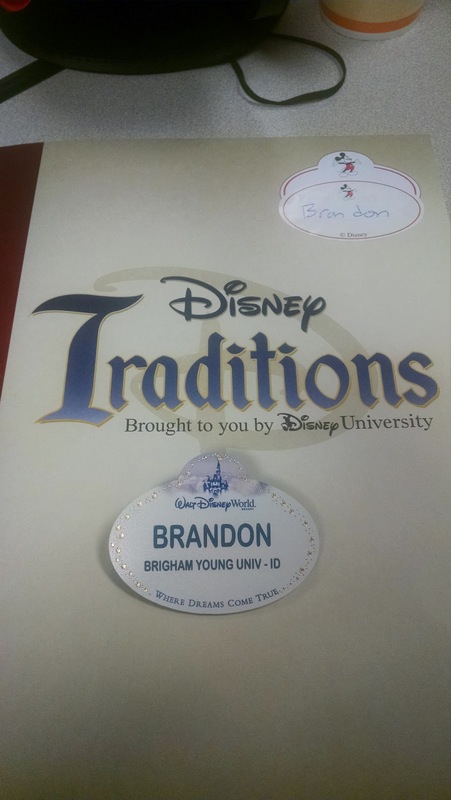 This was also at Disney University, and is a little more specific as far as working and utilizing the four keys that we had gone over at Traditions. Operations cast members are the ones that deal more with the guests directly, so people who are working things like attractions, merchandise, photographers, guest relations, transportation, custodial, vacations planners, parking, main gate greeters, and so on. The morning class was about as long as Traditions had been, after which we had a short lunch before going into different groups based on our roles. For me, I only had two more hours, but some were there in class for even longer while others got to go home right after lunch. This time I went over to the Magic Kingdom to have some fun, since I was already there and I didn't want to go home and change before going back out. I went on a few rides, familiarizing myself a little bit with the Fastpass+ system, which is completely new to me. I was surprised at how much more busy the Magic Kingdom was than Epcot the night before. However, I was visiting on a Saturday, which is going to be busy even in mid-January. Also the Magic Kingdom is a lot more popular to visit than the other parks, especially to families. It has a greater balance of things to do for guests of all ages than the other parks, so often if you can only visit one park, that's the one most people choose. Epcot is also bigger and more spread out than the Magic Kingdom is, and even though I might have encountered more people if I had ventured more into the park, they still have more area to fill before it starts to feel "full". Anyway, I'm just using these observations to say that I'm rather glad that I'm working at Epcot instead of the Magic Kingdom because it feels like it will be more manageable. Although if that is actually true or not yet remains to be seen. In all honesty, I'm really excited to start, but also nervous. I think that all of us feel that way in facing the unknown, and I try to remind myself that I'm going to be well taken care of and I really don't have anything to worry about. And yet, here I am, still nervous. But these two training days that I've had already have helped me to see how much just the little things we do as part of our job can make lasting memories of magic for the guests. I want to do that for someone. That's the reason I wanted to work for Disney, and it's part of why I'm here and why I can't wait to start. At this point (Sunday night), I have a park-specific training for Epcot as a whole tomorrow morning from 8am to noon, which is when I should get my schedule for the rest of the week. And I'm certainly hoping that I do, because otherwise I have no idea what I'm doing, since tomorrow is the last thing I've been informed about so far. I should also probably find out specifically what ride I'll be working, since I think we also go to Costuming after the tour. Either way, it should be a fun day!